You have probably heard about the link between hypertension--high blood pressure--and salt consumption. Physicians often advise to decrease your sodium intake or you could put your health at risk. But how much do you know about the other health risks of typical table salt? What you learn might surprise you. There is no question that salt is essential for life. Your body needs salt to function properly. But there is a vast difference between natural salt that can be beneficial to your body and the typical, refined table salt you probably have in your pantry. Typical table salt actually has nothing to do with the natural salt your body needs. In fact, table salt usually includes about 2.5 percent chemical additives. Further, typical table salt has been dried to over 1,200 degrees F, which alters its natural chemical and crystalline structure so much, the human body reacts to it much as it would any other toxin. The reason you doctor advises to reduce salt intake is because table salt causes blood pressure to rise rapidly. Your blood attempts to get the toxic element, salt, away from your heart as fast as possible. Retention of water and other fluids is another hazard of table salt consumption. Conditions such as gout, obesity and diabetes can be worsened. Unfortunately, reducing your salt consumption is not as easy as putting the shaker away. The more your body is fed with large amounts of unnatural salt--not just from the shaker, but from the vast amounts included in processed and packaged foods--the more your body seems to crave it. This salt overload can cause swelling, and lead to major kidney, liver and thyroid illnesses. Goiters, heart disease, strained elimination systems, hypertension, muscle cramps, water retention, stroke, heart failure, and major disorders of the nervous system, are all more likely. Particularly harmful to your circulatory and nervous system, table salt also poses a health hazard to the delicate balance of your body's lymph system. Salt is a natural antibiotic. It has been used through the ages to keep food from decaying. But this property also makes it kill good bacteria in your body. Salt also draws water, which means your body's normal absorption of water is disrupted, which can lead not only to constipation, but the accumulation of toxins in the intestinal tract. Because of how it is processed, the typical table salt you will bring home from your local grocer is completely depleted of the minerals your body needs. In their place are chemical additives that pose a threat to your health. These chemicals can include manufactured forms of sodium bicarbonate, iodide, fluoride, anti-caking agents--even toxic amounts of potassium iodide and aluminum derivatives. Many salts will also contain processed white sugar and MSG. Here's another surprise: that table salt didn't start out looking pure white in the natural world. Instead, it's been whitened by bleach. But there is a healthy alternative. Himalayan Salt has garnered the attention and favor of many medical and nutrition experts. 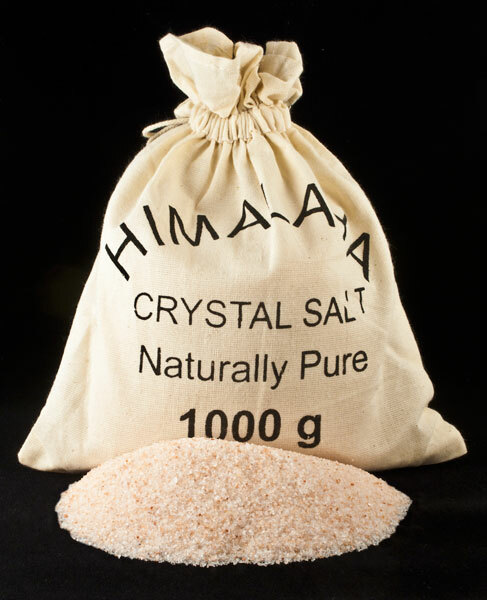 Instead of being harshly processed at high temperatures, Himalayan salt is carefully mined by hand to ensure the crystalline structure of this ancient salt is maintained. It is typically dried in the sun. Rather than pumping the product full of chemical additives, Himalayan salt contains natural sodium along with up to 84 trace minerals, including many essential for health and wellness. Switching to Himalayan salt for consumption eliminates the long list of health hazards present with table salt. Himalayan gourmet salt is not bleached for whiteness nor over-processed. It is sourced from deposits left by ancient oceans, carefully handled to ensure the best possible natural salt for your body. Replacing typical table salt with Himalayan crystal salt reduces a long list of health hazards and brings about improved health and wellness.